Can you find YOU on this map? 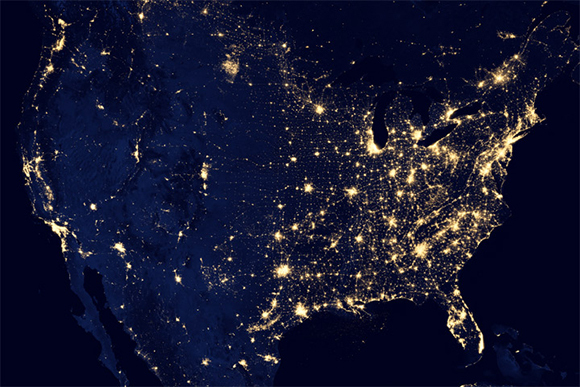 Major urban areas of the Eastern United States stand out like constellations in the night. The image is a composite from April and October 2012 satellite data and courtesy of NASA’s Earth Observatory. Enlarge image to see the full USA map. Results: From far above the Earth, a satellite's view of nighttime lights reveals the globe's most populous urban areas. A new method maps urban areas using the night sky light intensity measured by those satellites; the method was developed by researchers at Pacific Northwest National Laboratory working at the Joint Global Change Research Institute. They collaborated with scientists from the National Oceanic and Atmospheric Administration (NOAA) and The Ohio State University (OSU) to reduce the over- and under-estimations associated with previous techniques when mapping a large area. The new method also shows the potential to map the extent of urban areas with a global perspective, and the changes over time, using existing data in a cost-efficient way. "Our new approach will help build a series of consistent global urban maps—not currently available—which can be used in many fields," said Dr. Yuyu Zhou, PNNL geography scientist and lead author of the paper. The JGCRI is a partnership between PNNL and the University of Maryland. Why It Matters: Satellite photos show that the Earth is never totally in the dark. Bright dots of light shine through the night, and are a clear indication of human presence. In addition to offering stunning pictures, those lights can guide scientists working to uncover the extent of human activities and all that encompasses. Through this information, scientists can glean clues to changes in land use and land cover, water, and energy use. Urbanization, the increasing trend for humans to congregate in cities rather than rural areas, has profound effects on energy use, pollution, water use, and the carbon cycle due to changes in agriculture and vegetation cover. More accurate and timely information regarding the extent of urban areas is important for environmental modeling to inform urban and resource-use planners, and assist in projecting the impacts of climate change. Methods: The PNNL research team, with collaborators from NOAA and OSU, developed a new method to estimate optimal light thresholds and map the extent of urban areas using the DMSP/OLS NTL and supplementary data (see sidebar, Data Sources). This method is urban cluster based, different from previous regional or nationally based techniques. In the new method, the team identified potential urban clusters, which are groups of similar and continuous pixels from preprocessed NTL data using a segmentation technique. The new method can then derive optimal thresholds specific to potential urban clusters to delineate the urban extent, in ways that are neither costly nor complex and are globally applicable. This cluster-based optimal threshold approach can map urban extent more accurately compared to global threshold techniques. Even compared to previous regional-level threshold techniques, the new method successfully tackles the issue of under- and over-estimation, eliminating the need to manually define boundaries such as economic regions with urban clusters. The simplicity of the new method makes it promising to rapidly monitor urban areas globally and regionally using DMSP/OLS NTL data. What's Next? Scientists will extend the developed method to a global scale, and extend the time to over 20 years. In this way, they will build a consistent global urban map series and be able to evaluate the time-reactive nature of global urbanization. Sponsors: The NASA ROSES Land-Cover/Land-Use Change Program funded this research with additional support for Steven J. Smith from the Global Technology Strategy Project. Research Team: Yuyu Zhou, Steven J. Smith, Alison Thomson, and Marc Imhoff, PNNL; Christopher D. Elvidge, NOAA National Geophysical Data Center; Kaiguang Zhao, The Ohio State University. Reference: Zhou Y, SJ Smith, CD Elvidge, K Zhao, A Thomson, and M Imhoff. 2014. "A Cluster-based Method to Map Urban Area from DMSP/OLS Nightlights." Remote Sensing of Environment 147:173-185. DOI: 10.1016/j.rse.2014.03.004. NOAA's National Geophysical Data Center Earth Observation Group specializes in nighttime observations of light and combustion sources worldwide. Data collected in the Defense Meteorological Satellite Program, Operational Linescan System (DMSP/OLS), through a series of satellites, captures raw visible and thermal infrared light data and since 1992 has produced light processing algorithms and data products for scientific use. 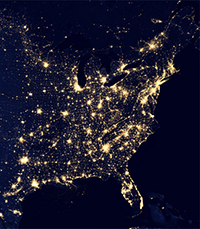 The DMSP/OLS Nighttime Lights (NTL) data are a valuable resource for regional and global urban mapping and studying human activities such as population density, economic activity, energy use, and carbon dioxide emissions.